The popular Russian comedian and singer Semyon Slepakov wrote a song about how weak the Russian national soccer team is. A video of Slepakov performing the tune was posted on Facebook on June 11 -- three days before the start of the 2018 World Cup, which is being hosted by Russia – and it instantly became a social media hit. Slepakov’s satirical song hits on many of the issues surrounding Russia’s preparation for the World Cup. These include the country’s economic stagnation, corruption, and overexploitation of natural resources; the incompetence of government agencies; and even the Kremlin’s use of information warfare. To prove his point, the comedian introduces into his song Russia’s most controversial political figure – the head of Chechnya, Ramzan Kadyrov. Slepakov sings that the Russian team would not be capable of winning the World Cup even if President Putin were to appoint Kadyrov as its new coach, which would represent an imminent death threat to team members. Kadyrov is also widely seen as the most feared man in Russia, due to his record of human rights abuses and alleged personal participation in torturing of the prisoners held in secret locations. 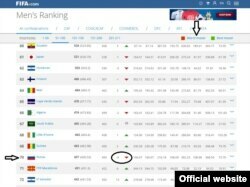 Despite the satirical form of Slepakov’s song and its use of hyperbole, it is in general factually accurate, and his assessment of the Russian national team corresponds with the FIFA’s ranking. In FIFA’s June 7, 2018 ranking, the Russian national team was ranked 70th among the world’s 206 national teams, and given a “worst mover” red label. This latest FIFA ranking is the Russian national team’s lowest, having dropped from 20th place in 2014. If Russia, which qualified automatically as the hosts, cannot muster a win against Saudi Arabia in the opening match on Thursday, the team will equal a winless record set in 1912, when the country was still ruled by Tsar Nicholas II, and matched in 1998, the Russian newspaper The Moscow Times reported. More than 145 million Russians are football fans, but the national team and its fans have been accused bad behavior, including racism and violence. Still, President Vladimir Putin promised the World Cup in Russia will be flawless. Meanwhile, the Kremlin said on June 14, that 15 foreign leaders attended the World Cup’s opening ceremony. They included eight from neighboring former Soviet countries and two from South Ossetia and Abkhazia -- the Russian-backed breakaway regions of Georgia.